Every company, of every size, in every corner of the globe collaborates on one level or another. At one end of the spectrum lies tactical communication and coordination between people, teams, partners and customers. However, the other end of the spectrum is reserved for those who have established the tools, process and culture, and optimized their environment for Collaboration – those who are Collaborating with a “big C”. As an industry, we’ve spent the last 10 years focusing on the technology side of the Collaboration discussion. This is not surprising, as we’ve experienced a tsunami of new solutions that promise to bring virtual teams together, increase productivity, and drive results. The focus during this time has been on the tactical benefits of Collaboration solutions, with success defined through volume-based metrics and cost savings analysis. The best-in-class Collaborators, however, are actively shifting their focus, placing a greater emphasis on the way end-users naturally collaborate, and fostering the evolution of Collaboration from a tactical point-solution to a broad concept of how work gets done. 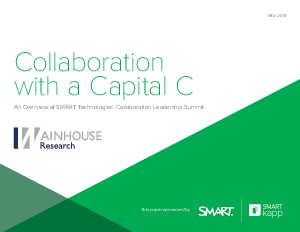 This paper is the first in a series of publications that explore the insights gathered from the SMART Technologies Collaboration Council. Each of the upcoming papers in this series will dive deep into key findings, providing the Council’s thoughts, opinions, and best practices.